HAYS, Kan. – A wise man once said, “You don’t know if you’re winning if you don’t keep score.” That man was Bob Schmidt, former president and CEO of Eagle Communications in Hays. Schmidt died in August 2017, but his legend lives on. Because of the generosity of Schmidt and other longtime local philanthropists, fans of Fort Hays State University Tiger athletics will be able to do much more than see the score of the game on a new video board at Lewis Field Stadium. Thanks to another Hays couple, Verlin and Elaine Pfannenstiel, FHSU already has been reaping the benefits during this school year from a new four-sided video board in Gross Memorial Coliseum. 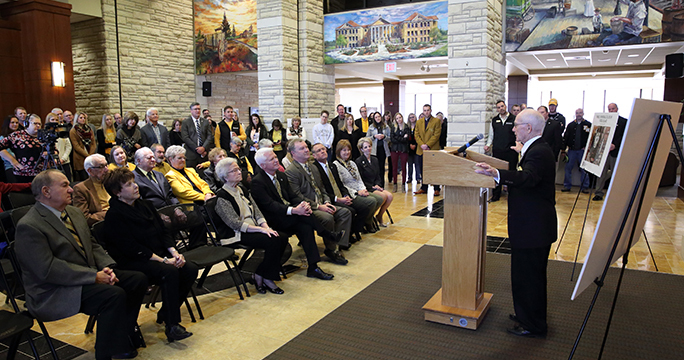 Friday in the Sunset Atrium of FHSU’s Memorial Union, members of Fort Hays State and the Hays community gathered to recognize and thank those donors. Typical of this particular group of FHSU donors, they were the ones doing the thanking. “We would like to thank Fort Hays State University and (Athletic Director) Curtis Hammeke for allowing us the opportunity to be a part of the Tiger athletic program and this video board project,” the Pfannenstiels said in a prepared statement. “I’m happy that you’re happy, from the bottom of my heart,” Don Bickle said. Don and Chris Bickle partnered with the Bob and Pat Schmidt Foundation and Eagle Communications to make possible the addition of the huge new video board at Lewis Field Stadium. Bickle and Schmidt, both prominent businessmen, partnered on numerous ventures over the years, both at Fort Hays State and in the Hays community. At the south end of Lewis Field Stadium sits the Schmidt-Bickle Indoor Training Facility that was completed in 2013. Now, the north end of the field will flash videos, replays, scores and statistics on the Bickle-Schmidt Video Board. The board, which also will have the Eagle Communications name on it, is scheduled for its debut at the Tiger spring football game on April 21. After Schmidt died, Bickle met with Gary Shorman, Schmidt's successor as president and CEO of Eagle Communications when Schmidt retired in 1998. “I told Gary I wanted to do one more project with Bob,” Bickle said. “This was a project that Bob was working on before his passing,” Shorman said. “We believe in what Fort Hays State is doing, and this was a great opportunity to partner with the FHSU Foundation that Bob has been a part of, as well as Eagle Communications. This is a great way to be able to help a project get started that the university needed, that sets off our university as one of the best." Hammeke and two FHSU coaches spoke at the news conference – Chris Brown, who guided the Tiger football team to the most victories in school history last fall with their 11-1 effort, and Tiger women’s basketball coach Tony Hobson, one of the top women’s basketball coaches in the country. Hobson reached the 600-win career coaching mark earlier this season, and the Tigers’ next victory will be his 200th at Fort Hays State. Support from the community is not lost on Brown. Hobson mentioned numerous additions and improvements to athletic facilities in his 10 years at FHSU. The latest step forward, of course, are the video boards. Basketball is near and dear to the Pfannenstiels, both FHSU graduates who raised their five children in Hays. All five of the Pfannenstiel siblings attended their hometown university, with four of them earning degrees. Now, the Pfannenstiels are fixtures in courtside seats in Gross Memorial Coliseum. Now, thanks to the Pfannenstiels, even fans in the upper level seats get to see some up-close action on the giant new video board. To learn more about the FHSU Foundation and the funding needs of Fort Hays State, visit http://foundation.fhsu.edu, call 785-628-5620 or email foundation@fhsu.edu.